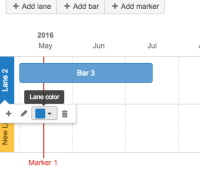 [CONFCLOUD-53958] Not able to change colours in Roadmap Planner macro - Create and track feature requests for Atlassian products. When using the roadmap planner on a page on Confluence the user is not able to change the colours of the roadmap planners boards. Click on the left side on the board where says "Lane1" or "Lane2"